During Spring 2019, IS&T will be migrating all Staff and Faculty email accounts from on-premise email servers to Office 365. Please note that all data and settings will be preserved during the migration. Staff and Faculty will be notified prior to the migration process. Instructions for exchange email access are listed below. Familiarize yourself with our Usage Guidelines on using your Chapman email appropriately. Staff and Faculty will be notified prior of their migration date. For first time setup, please follow the instructions below. Choose your prefered "look" (Colorful or Classic) and click "Continue". Enter your Chapman University account password and click "Sign In". For adding an account, please follow the instructions below. Click the "+" (Plus sign) on the bottom-left side of the screen. DO NOT select “configure manually”. Select “Accept” on the permissions requested page. 7. You will get a warning that Exchange has security features that will need to be enforced. You must agree to this to get email on your device. 8. Choose the items you want to sync on your device. 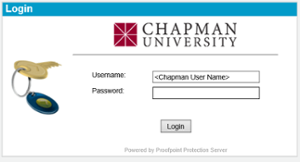 Chapman University IS&T has implemented an additional feature to our email system. The feature will separate suspicious email messages from regular email, and place them in a quarantine area for you to manage. As of January 2017 we are using a product called Proofpoint for this process. The Proofpoint email filtering system places messages that are suspected to be spam or other unwanted email into your personal Quarantine, where they are held to give you time to review them. After 30 days, unreleased messages will automatically be deleted from Quarantine and become irretrievable. You will receive a daily quarantine digest email in your inbox and from that email, you can perform most of the task including, delete, release, add to safelist. If you would like to review your quarantined messages between daily digests, log into http://junkmail.chapman.edu or click the "Request New End User Digest" link at the top of your most recent digest message. An End User Digest is a summary email from Chapman University that you receive daily. It contains a list of the suspected spam that has been filtered in the previous 24 hours. Opening it displays an email listing of the suspected spam messages. You will not receive a digest if none of your mail has been quarantined during that timeframe (this is an "empty digest"), although, if you prefer, you can manage your settings to receive an "empty digest". Release - Delivers the message to your Inbox. Automatically reports that the message was not spam. Safelist - Delivers the message to your Inbox, adds the sender to your Safe Senders List, automatically reports that the message was not spam. Future messages from this sender will not be sent to your Quarantine and will be delivered to your inbox even if the message is determined to be spam. Not Spam - Reports to the system administrators that the message was not spam. Proofpoint will update its scanning engine about the message characteristics, and it will not be quarantined in the future. Score – Messages are scored on a scale from 1 to 100; the higher the score, the higher the probability that the message is spam. Request Summary Digest – Click this link to have a new summary digest showing all current messages in the quarantine outside the regular schedule. Request Safe/Blocked Senders List - Click this link to have a full listing of all your safe and blocked senders emailed to you. Manage My Account - This link will sign you in to http://junkmail.chapman.edu, where you can access your Quarantine, manage your settings, or update your safe and blocked senders lists. Help - Takes you to the help page on the Proofpoint server. Type in your Chapman user name: Ex) "asmith"
Messages that contain a virus, spam, or inappropriate content are sent to your Spam Quarantine. Email classified as “bulk” – solicitations, newsletters, and advertisements are sent to your personal Low Priority Mail Quarantine. You will receive an email notification named Digest in your Inbox to let you know you have messages in the Quarantine. Release the selected message(s) from the Quarantine and allow future messages from the sender(s) to be delivered – select the message(s) and click Allow Sender. Delete the selected message(s) from the Quarantine and block future messages from the sender(s) to be delivered to your Inbox – select the message(s) and click Block Sender. The currently-selected folder in the left pane displays messages in that folder. In the illustration, the Low Priority Mail – Delivered messages display in the right pane. Unselect All – clears the selection box for all of the currently-selected messages. Request Digest – this choice sends you the latest email Digest. Refresh – refreshes the right pane. If you use the Delete All choice, use Refresh to display more messages. Delete All – deletes the currently-displayed messages from your personal Quarantine. Select Lists in the left pane to add senders to your personal Safe Senders and Blocked Senders lists. Select Profile in the left pane to change your preferences. What is going to happen to my old quarantined message? Your old quarantined email messages (prior to the January 20, 2017 migration to Proofpoint) will not be migrated to the new service. Those email messages will be held at the following website for up to 90 days: http://junkmail2.chapman.edu. Email messages older than 90 days from the migration date will expire each day and after 90 days has passed, all quarantined messages will be delete. You should use your email digest that you received prior to the migration date to review the email messages or log on to the old site at http://junkmail2.chapman.edu to make sure no legitimate email messages are lost. After 90 days, all of your quarantined email message will expire and will be deleted. What are suspicious or quarantined email messages? Emails that contain spam, phishing attempts and other objectionable content. A kind of fraud perpetrated over email. It is a type of identity theft. The goal of a phishing is to trick you into giving out your email login name and password. Learn more about phishing and how to prevent its unwanted consequences. How will I receive quarantined notifications? If you are sent new suspicious messages they will be captured by the quarantine manager. Then once a day in your Inbox, you will receive an email listing any new quarantined email. The message will be from noreply-quarantine@chapman.edu. If there are no new quarantine messages, then you will not receive an email. How long are quarantine messages held? Initially, messages in your daily Quarantine Manager will be held for 30 days. After 30 days, the messages will automatically be deleted unless action is taken. What if I delete a quarantined email message? A deleted quarantined message cannot be retrieved. Why am I not receiving a Chapman Quarantine notification email? You will only receive a Chapman Quarantine notification if the system blocked suspected spam messages. If no emails were held, you will not receive a notification email. What if I ignore the notification emails? If you take no action, the messages in your quarantine will automatically be deleted after 30 days. 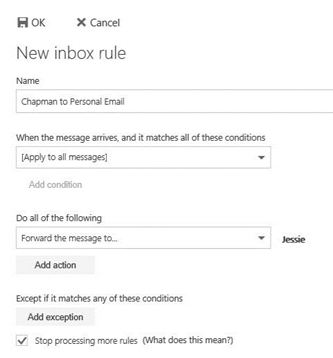 Now that Chapman Quarantine Manager is being used, should I turn off Spam/Junk in my Outlook? We recommend leaving your Spam/Junk email filters alone in your Outlook software. 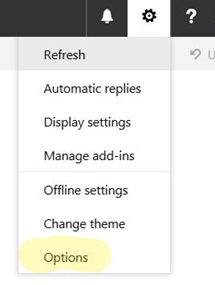 If you have changed the setting already, we recommend changing the setting to “No Automatic Filtering” setting in your Outlook software. How do I check my quarantine items using the web interface? What if I receive a Phishing message, whom do I send the report to? 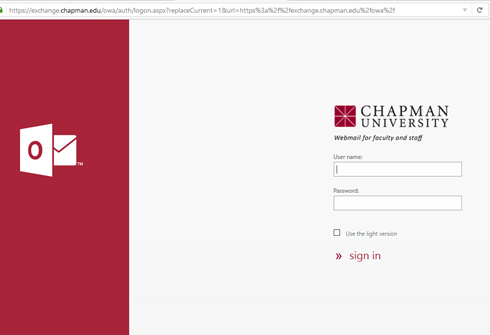 Login to exchange.chapman.edu, using your regular Chapman credentials to login. 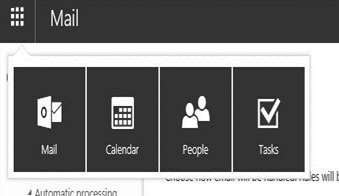 First step, click on the 3x3 squares, then under People, you will create a contact. 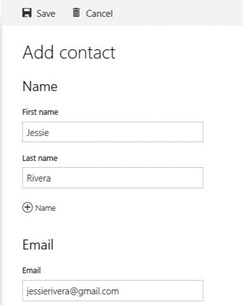 Fill out the: FN, LM and email fields. In the email field, you will input the email that you will be using to forwarding all your Chapman email. On the top right, click on the gears icon, then click option. 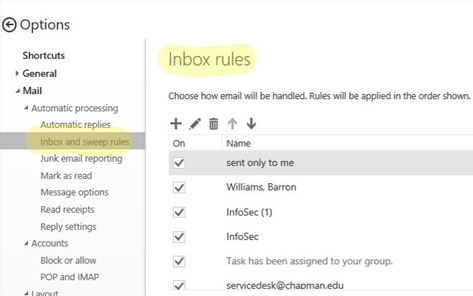 On the left, click on “Inbox and Sweep Rules” and the “Inbox Rules” preferences will appear. Click on the + to add the forwarding rule. Name: Chapman to Personal Email. When the message arrives, and it matches all the conditions: [Apply to all message]. Do all the following: Forward the message to, select the contact you created on step 1. Last, click OK to save.